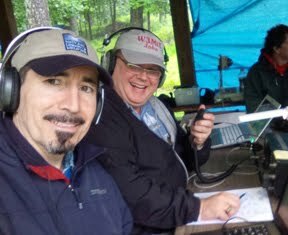 Some NIHRAC members joined the Randallstown Amateur Radio Club during the ARRL Field Day 2015 event. The group setup radio stations at the Washington Monument State Park in Middletown, MD, as a "2A" station which used only emergency power. This was a fun but very effective emergency preparedness activity that tested the capabilities of the group to deploy during an emergency and operate continuously for 24 hours. The team communicated successfully on HF and VHF, using a variety of radio communications modes, including phone (voice), CW, PSK31 and WL2K packet and Pactor. During the event, hams also experimented with high-speed point-to-point radio links to provide Internet connectivity to the camp site. The weather provided a challenging storming environment on Friday--during setup--and Saturday, but rewarded the group's efforts efforts with a beautiful sunny Sunday. Several visitors were involved in the communications activities via the Get On The Air (GOTA) radio station. Once again, Field Day was source of valuable and memorable experiences for all involved.